A schoolboy has been left heartbroken after his bike was stolen.Nine-year-old Jack Rogers had left his bright green BMX in the back garden of his home in Berridge Road, Sheerness. It was taken on Saturday, between about 2pm and 3.30pm. There is a 6ft high wall around the garden and his mother, Stephanie Heaton, believes the thief must have climbed over to get in as the gate is bolted from the inside. Only Jack's bike was stolen from the garden, despite his younger brother Connor's bike being alongside it. The BMX was the West Minster Primary School pupil's Christmas present two years ago and Ms Heaton said he had had his heart set on it for a long time and he is devastated. She is hopeful someone may have noticed the thief climbing over the wall and is appealing for people to come forward if they have any information. Ms Heaton said she was in all day except for the 90 minutes when she thinks it must have been taken as she had gone into town. The 31-year-old added: "He's pretty heartbroken that his beloved bike has gone. "I'm wondering if someone saw him out on it and followed him back and stole it as they didn't take my younger son's bike." The bike, which is worth about £100, has a frayed brake cable on the back and is rusty at the front and the handgrip is broken on the very end. Sgt Stefan Martin, of the Island Neighbourhood Team, said: "These thefts can be very opportunistic so we always promote the use of a good quality cycle lock to deter thieves. "We also recommend that cyclists mark their bikes with a UV pen. "This means that if we recover a stolen bicycle it will be easier for us to return it to its rightful owner. "The bike that was stolen was marked so that will help with identifying the owner should we recover it." POLICE are appealing for information after a moped was stolen from the rear garden of a home in South Somerset. The theft took place sometime between Saturday, September 17, and Saturday, September 24, when a yellow Gilera 50cc moped was taken from a garden in Baunton's Orchard, Milborne Port. The moped was stolen with the rear number plate still attached but it is not drivable, possibly stolen for scrap. PCSO Mandy Forsey said: "This has made the victim very distressed - the victim was hoping to sell it for scrap to enable him to be able to buy something else. "We are appealing for anyone locally who may have seen or heard these people to come forward. If you see a vehicle matching this description or it is seen or dumped we would ask you to report it to police." Anyone with information can contact local police on the new non-emergency number of 101 or Crimestoppers on 0800-555111. Brechin Police are appealing for information about a number of thefts that have occurred over the last week. A large garden ornament was stolen from a garden in Duriehill Road, Edzell at sometime between Friday, September 9 and 3 pm on Monday, September 12. The ornament is a concrete fox with two cubs, about one foot in height, coloured and very heavy. This item is of sentimental value and the owners are keen to have it returned. Edzell residents are asked to check their gardens in case this item has been left in their garden or alternatively, if anyone has any information which may be of use they should contact Tayside Police on 0300 111 2222. A PARTIALLY sighted teenager has blasted the robbers who stole £90 of solar lights from her front garden, which guided her out of the house. The 14-year-old and her mother, who did not want to be named because they fear reprisals, said the robbery of the 22 lights from their Kirk Hallam garden, was ‘disgusting’. The girl, who suffers from a number of problems with her eyes and can only see three metres in front of her is registered blind. For the last five years her mother has been lining the route from their front door to the garden fence with the lights, which automatically turn on when it gets dark, to help her find her way as the nights draw in. The teenager said: “It’s just disgusting. “It makes me feel that somebody has invaded our garden – our own space. As well as the lights, the callous thieves stole ornaments, of mostly sentimental value, from the garden and ripped the roof off a wishing well. “It’s just the fact that they’ve come up all the way round the garden to steal them ,” said the mother. The girl and her mother have now said they will contact the police about the robbery which happened at some point between Friday August 19 and the following morning. The incident is one of a string of anti-social behaviour offences in Kirk Hallam over the last few months. “It’s definitely getting worse around here, especially with the gangs you see hanging around,” added the girl’s mother. Police have said they have stepped up patrols in the town after a number of incidents. These have included one in which resident Paula Fletcher had a for sale sign smashed through her window by thugs, two weeks ago. Shopkeepers in Queen Elizabeth Way have organised a petition to install CCTV after they say gangs who congregate there every night are a constant nuisance. A 40-year-old Southport man has been jailed for 12 weeks for stealing power tools from garden sheds.Gregory Hawkshaw, of Park Street pleaded guilty to stealing from sheds on Cumberland Road and Rutland Road at North Sefton Magistrates Court on Tuesday. Officers arrested Hawkshaw and another accomplice – not the person who had been in the gardens with him – who had spotted in the bushes by officers. This youth cannot be named for legal reasons. He pleaded guilty to handling stolen goods and will be sentenced next week. Defence solicitor Graham Halliwell said: “My client has made an early guilty plea and assisted the police with the recovery of other stolen goods.” Mr Halliwell asked for Hawkshaw to be given a community-based penalty, but magistrates senctenced Hawkshaw to 12 weeks. Statues valued at £85,000 stolen in North Yorkshire. Three metal statues together weighing one and a half tonnes have been stolen from a garden in North Yorkshire. 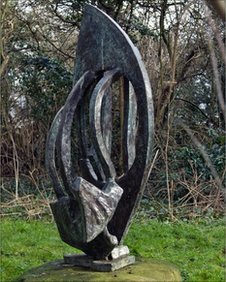 Two bronzes and a 10ft (3m) copper statue were stolen from Cawood near Selby. They are valued at £85,000. The owner and sculptor was said to be "deeply upset" by the theft. Det Con Lee Maeer of Selby CID said that scrap metal dealers should contact the police if offered "large quantities" of copper or bronze. Police appealed for information. "It is possible that the thieves spent time in the area prior to the theft," added Det Con Maeer. One of the bronze statues, Mayflower 2, is circular with a bar across the top and is 3ft (1m) high. POLICE are trying to find a statue of Buddha that was taken in a garden theft. The foot-tall, grey pot ornament was swiped from a garden in Greatham, on the outskirts of Hartlepool, during the night of Tuesday, August 30. The statue, which stood in a garden in Queensway, is said to be very heavy. Police are appealing for witnesses and information after a gorilla statue was stolen from a garden in Old Sodbury. The brown fibreglass 'baby gorilla' statue was created to mark the 175th anniversary of Bristol Zoo. Pupils from Old Sodbury Primary School had decorated it with their names and it had been loaned out to the community over the summer holiday. It was taken from Church Lane between 6pm and 11.30pm on Saturday August 27 2011. Anyone with any information about the theft is asked to contact Chipping Sodbury police station on 0845 456 7000 (or 101 from September 19 2011). Alternatively call the independent charity Crimestoppers on 0800 555 111. They never ask your name or trace your call.